Liam Jurrah trial, Day 3, afternoon: Did he smash a car? Chief Justice Trevor Riley told jurors to “put to one side” anything that they may hear reported about the fighting outside the courthouse today and to “concentrate” only on the evidence heard in the courtroom. That evidence had included this morning an important admission by Ingrid White. 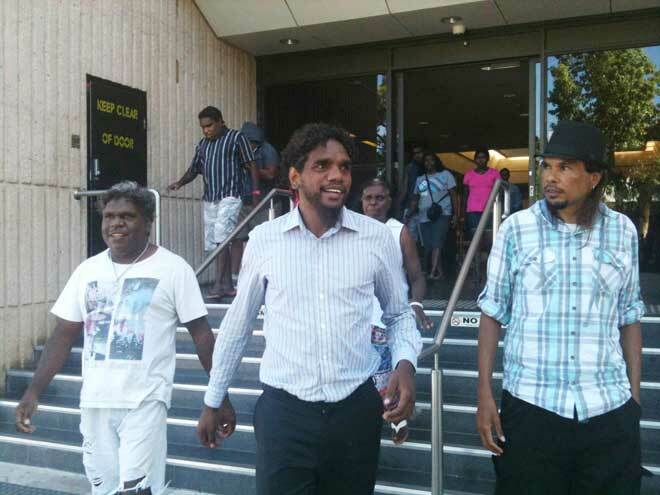 Yesterday she had told the court that Liam Jurrah had hit her on the head with a nulla nulla, causing “a little cut”. Under cross-examination by Jon Tippet QC she agreed that this was “an accident”, as she told the police at the time. It happened because she got in between Liam Jurrah and Lemiah Woods who were arguing. Final witness for the day, Samuel White, did not give any evidence that put a weapon in Liam Jurrah’s hand – “it was dark” – nor did he see him fighting, only arguing. As the court adjourned, all was quiet outside. A few family groups were still on the lawns where TV journalists were choosing to do their pieces to camera. The mobile police van was parked nearby.